Sea Pines Golf Course Hua Hin (also known as the Army Golf Club II) is set along the Gulf of Thailand in the Suan Son Pradiphat (Sea Pine Tree Garden). The majority of the Sea Pines area is comprised of bracken pine trees and is enriched by the beauty of oceans and mountains. The army originally developed the site as a form of retreat for serving soldiers and veterans and the challenges. 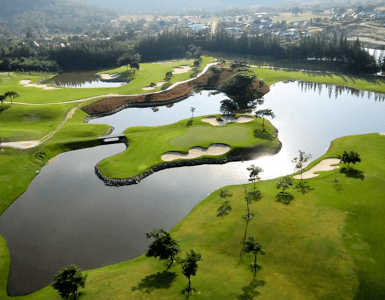 Sea Pines Golf Course Hua Hin design and layout have been developed to provide golfers with a wide variety of challenge. Wind conditions cause the course to play quite differently from day to day, with six holes fronting along the beach and other holes in the shadows of mountains. 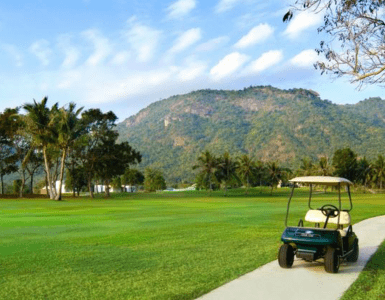 Sea Pines Golf Course Hua Hin is designed with six holes lying on the backside and the lies towards the mountains divided by the railroad. The dogleg, par-5 12th hole is one of the most challenging, as the design affords it protection in the form of fairway bunkers and a water hazard along the right-hand side. Down the stretch at Sea Pine, the sea breeze becomes a factor and the last three holes are among the most memorable in Hua Hin golf. Hole 16 is another par five dogleg that requires a drive to a narrow downhill landing area with water looming on both sides. The toughest part of this hole is the approach shot. The signature 17th hole is a par three with a spectacular ocean view backdrop. The tee shot is all carry over water to a wide undulating greenprotected by beach sand front and rear. The key here may be to attack the front pins but play to the center of the green otherwise, depending on the wind as you make your decision facing the large lake and peninsula green. A canal poses a major hazard that requires golfers to drive 220 yards over water to reach the fairway. A safe lay-up approach with a fairway wood is an available option for conservative players.